December 29th: Pikes Peak Traditional Dance in Colorado Springs. November 17th: Pikes Peak Traditional Dance in Colorado Springs. August 18th: Pikes Peak Traditional Dance in Colorado Springs. June 30th: Pikes Peak Traditional Dance in Colorado Springs. May 19th: Pikes Peak Traditional Dance in Colorado Springs. February 17th: Pikes Peak Traditional Dance in Colorado Springs. December 30th: Pikes Peak Traditional Dance in Colorado Springs. November 18th: Pikes Peak Traditional Dance in Colorado Springs. September 16th: Salida Contra Dance. Poncha Springs Town Hall, 330 Bernett Ave. in Poncha Springs. Click here for more info. September 30th: Pikes Peak Traditional Dance in Colorado Springs. May 20th: Pikes Peak Traditional Dance in Colorado Springs. November 19th: Pikes Peak Traditional Dance in Colorado Springs. September 17th: Salida Contra Dance. Salida Scout Hut in Riverside Park. Click here for more info. May 21st: Pikes Peak Traditional Dance in Colorado Springs. April 30th: Rock-it! is playing the Pikes Peak Traditional Dance in Colorado Springs. September 26th: Salida Contra Dance. Salida Scout Hut in Riverside Park. Click here for more info. April 3rd: Rock-it! will be playing the Boulder Community Dance in the Avalon Ballroom, 6185 Arapahoe Road, Boulder CO. Rock-it! is a dance band featuring Pat and Kate from The Toe Dusters along with John and Sue Reading from Broomfield based Balance and Swing. Two fiddles, piano and banjo really Rock-it! April 18: Rock-it! is playing the Pikes Peak Traditional Dance in Colorado Springs. January 31th: Pikes Peak Traditional Dance at All About Dance studio, 2318 Vickers Dr, Colorado Springs. November 29th: Pikes Peak Traditional Dance at All About Dance studio, 2318 Vickers Dr, Colorado Springs. November 15th: Salida Contra Dance. Salida Scout Hut in Riverside Park. Click here for more info. 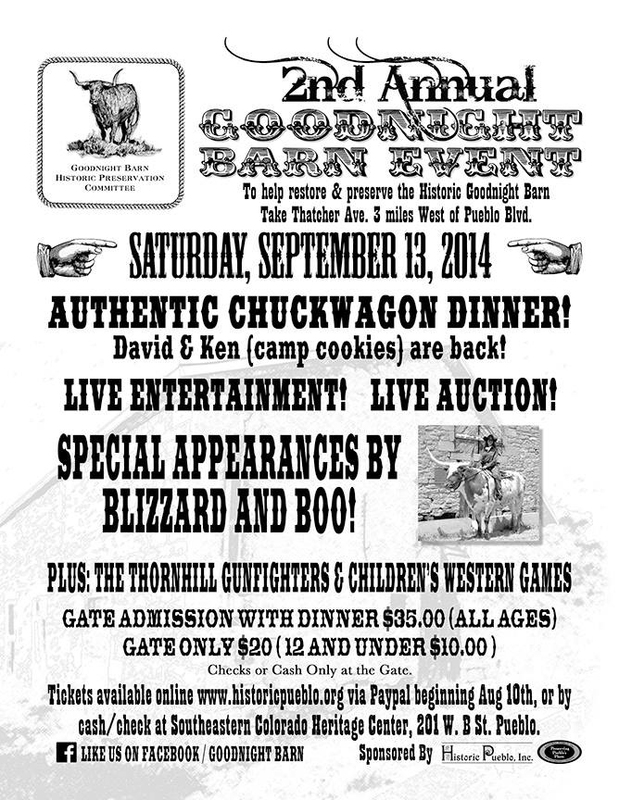 September 13: 2nd Annual Goodnight Barn Fundraiser at 2:00pm. The property is located at 5475 W. State Hightway 96, Pueblo CO. More info. September 20th: Salida Contra Dance. Salida Scout Hut in Riverside Park with guest guitarist Stephen Smallzel from Salida. Click here for more info. July 5: Rock-it! is playing the Fort Collins contra dance. Rock-it! is a dance band featuring Pat and Kate from The Toe Dusters along with John and Sue Reading from Broomfield based Balance and Swing. Two fiddles, piano and banjo really Rock-it. July 11th: 8-11pm. The Toedusters are Playing the Denver Community Dance, Highlands Masonic Center, 3550 Federal Blvd., Denver CO.
July 19th: The Toe Dusters are playing the Pikes Peak Traditional Dance in Colorado Springs. Helle Hill is calling. May 17: Rock-it! is playing the Pikes Peak Traditional Dance in Colorado Springs. February 8th: Sponsors reception, 19th Annual Chocolate Indulgence benefit for the YWCA Family Crisis Center. 5:30pm at the Pueblo Convention Center. February 15th: Pikes Peak Traditional Dance with Rick Smith calling. December 21st: Pikes Peak Traditional Dance at Celtic Steps, 3333 North El Paso St, Colorado Springs. Carol Fey calling. December 27th: Rock-it will be playing the Denver Community Dance. Highlands Masonic Center, 3550 Federal Blvd., Denver. Colorado Friends of Old Time Music and Dance. Rock-it is a hot dance band featuring Pat and Kate from The Toe Dusters along with John and Sue Reading from Broomfield based Balance and Swing. Two fiddles, piano and banjo really Rock-it. November 1: 8-11pm, Rock-it! will be playing the Boulder Community Dance, Avalon Ballroom, 6185 Arapahoe Road, Boulder CO. Rock-it is a hot dance band featuring Pat and Kate from The Toe Dusters along with John and Sue Reading from Broomfield based Balance and Swing. Two fiddles, piano and banjo really Rock-it. November 22: 8-11pm. Denver Community Dance, Highlands Masonic Center, 3550 Federal Blvd., Denver CO.
October 19: 6-8:30pm. Salida Family Halloween Contra Dance. Salida Scout Hut in Riverside Park. Sponsored by Arkansas Valley Music and Dance. September 7: Durango Contra Dance: Park Elementary School, 623 East 5th Ave., Durango CO. Beginner instruction 7pm, Dance at 7:30pm. September 14: Contra dance in Westcliffe Colorado. Calls by Nick Wilson. Dance starts at 8:00pm, with a lesson at 7:30. The dance will be at 709 Main St in the Custer County School (west gym). August 14th: Salida. Wednesday night dance at the Riverside Park Band Shell in Slida. 7-10pm..
July 11th: Thursday night Pikes Peak Traditional Dance series at Manitou City Hall (606 Manitou Ave). July 20th: Pikes Peak Traditional Dance at Manitou City Hall (606 Manitou Ave). June 13th: Thursday night Pikes Peak Traditional Dance series at Manitou City Hall (606 Manitou Ave). Weekend of May 17-19: Planter's Moon festival 2013. Three day music and dance festival starts 5:00pm on Friday and runs through 4:00pm Sunday. Held at the Colorado Mountain Ranch, 45 minutes west of Boulder CO.
May 24th: Rock-it will be playing the Denver Community Dance. Highlands Masonic Center, 3550 Federal Blvd., Denver. Colorado Friends of Old Time Music and Dance. Here is a link to a map. April 6th: Westminster Old-Time Community Dance held at the Westminster Grange from 7 to 10pm. The address is 3935 West 73rd, Westminster CO. Pat Tognoni will be calling. April 20th: Pikes Peak Traditional Dance at Celtic Steps, 3333 North El Paso St, Colorado Springs. March 16th: Pikes Peak Traditional Dance. Rock-it. A hot dance band featuring Pat and Kate from The Toe Dusters along with John and Sue Reading from Broomfield based Balance and Swing. Two fiddles, piano and banjo really Rock-it. February 8th: Sponsors reception, 18th Annual Chocolate Indulgence benefit for the YWCA Family Crisis Center. 5:30pm at the Pueblo Convention Center. December 15th: Pikes Peak Traditional Dance at Celtic Steps, (3333 N. El Paso St.). December 29th: Pikes Peak Traditional Dance at Avanti Ballrom, (1337 N. Academy Blvd.). September 21st: Boulder Community Dance Joining a new combo dance band called Rock-it: Avalon Ballroom, 6185 Arapahoe Ave, Boulder CO.
September 29th: Pikes Peak Traditional Dance at the First Christian Church, 16 East Platt Ave. Colorado Springs CO.(map) Pat Tognoni calling. August 4th: Salida Farmers Market. Alpine Park, 5th & E Streets, Salida CO.
August 5th: Buena Vista Farmers Market. 409 E. Main St., Buena Vista, CO.
August 11th: Old-time Dance during Buena Vista's Gold Rush Days with Eleanor Fahrney calling. McPhelemy Park, Buena Vista, CO. Sponsored by Arkansas Valley Music & Dance. August 18th: Pikes Peak Traditional Dance at Celtic Steps, 3333 N. El Paso St., Colorado Springs. Carol Fey calling. July 14: Colorado Springs Down Syndrome Association Barn Dance held at Pinello Ranch. July 27: 8-11pm. Denver Community Dance. Highlands Masonic Center, 3550 Federal Blvd., Denver. . Colorado Friends of Old Time Music and Dance. Here is a link to a map. June 16th: Pikes Peak Traditional Dance at Manitou City Hall (606 Manitou Ave). Carol Fey calling. June 23rd: Salida Contra Dance. Salida Scout Hut in Riverside Park. 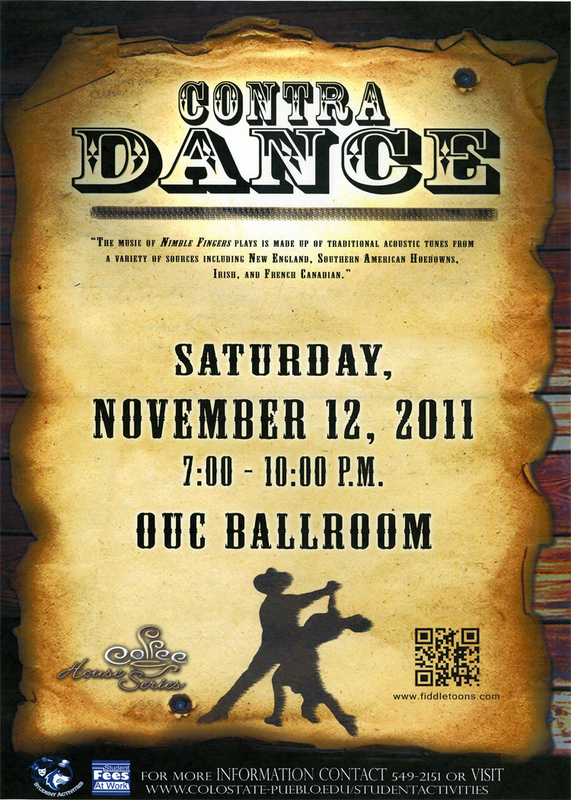 The dance runs from 7:30 - 10:00pm. Click here for more info. April 14th: Pueblo Contra Dance. Helle Hill calling. Washington Children’s Center located at the corner of S. Prairie and Thatcher. The dance runs from 7:30-10pm, with a lesson at 7pm. For more information check here. March 10th: Pueblo Contra Dance. Pat Tognoni calling. Washington Children’s Center located at the corner of S. Prairie and Thatcher. The dance runs from 7:30-10pm, with a lesson at 7pm. For more information check here. February 4th: Private Contra Dance in Loveland Colorado. Pat Tognoni calling. February 10th: Contra dance for the NODA Regional Student Confernce. CSU-Pueblo, Occhiato Ballroom. Chris Kermiet calling. February 11th: Pueblo Contra Dance. Chris Kermiet calling. Washington Children’s Center located at the corner of S. Prairie and Thatcher. The dance runs from 7:30-10pm, with a lesson at 7pm. For more information check here. January 14th: Pueblo Contra Dance. Duffy Boyle calling. Washington Children’s Center located at the corner of S. Prairie and Thatcher. The dance runs from 7:30-10pm, with a lesson at 7pm. For more information check here. December 10th: Pueblo Contra Dance. Richard Myers calling. Washington Children’s Center located at the corner of S. Prairie and Thatcher. The dance runs from 7:30-10pm, with a lesson at 7pm. For more information check here. November 19th: Pikes Peak Traditional Dance in Colorado Springs. Helle Hill Calling. November 12th: Pueblo Contra Dance. Cliff Sanden calling. In partnership with CSU-Pueblo we will be holding the (November only) Pueblo Contra Dance in the Occhiato Ballroom on the campus of CSU Pueblo. See the University's flyer here. October 8th: Pueblo Contra Dance. Pat Tognoni calling. Washington Children’s Center located at the corner of S. Prairie and Thatcher. The dance runs from 7:30-10pm, with a lesson at 7pm. For more information check here. October 15th: Pikes Peak Traditional Dance in Colorado Springs. Pat Tognoni Calling. September 4th: Private wedding reception followed by a Contra Dance - in a beautiful Colorado mountain resort - under an outdoor pavilion. WOW - what a great idea! September 10th: Pueblo Contra Dance. Chris Kermiet calling. Washington Children’s Center located at the corner of S. Prairie and Thatcher. The dance runs from 7:30-10pm, with a lesson at 7pm. August 13th: Private Wedding Anniversay Party. July 8th: Union Avenue celebration of C.R. Hedges 153rd brithday. June 11th: Pueblo Contra Dance. Mark Turbin calling. Washington Children’s Center located at the corner of S. Prairie and Thatcher. The dance runs from 7:30-10pm, with a lesson at 7pm. For more information check here. May 14th: Pueblo Contra Dance. Pat Tognoni calling. Washington Children’s Center located at the corner of S. Prairie and Thatcher. The dance runs from 7:30-10pm, with a lesson at 7pm. For more information check here. April 9th: Pueblo Contra Dance. Duffy Boyle calling. Washington Children’s Center located at the corner of S. Prairie and Thatcher. The dance runs from 7:30-10pm, with a lesson at 7pm. For more information check here. March 12th: Pueblo Contra Dance. Pat Tognoni calling with guest musician Damian Rotolo on bass. Washington Children’s Center located at the corner of S. Prairie and Thatcher. The dance runs from 7:30-10pm, with a lesson at 7pm. For more information check here. February 12th: Pueblo Contra Dance. Chris Kermiet calling with guest musician Damian Rotolo on bass. Washington Children’s Center located at the corner of S. Prairie and Thatcher. The dance runs from 7:30-10pm, with a lesson at 7pm. For more information check here. January 8th: Pueblo Contra Dance. Cancelled. December 11th: Pueblo Contra Dance. Richard Myers calling. Washington Children’s Center located at the corner of S. Prairie and Thatcher. The dance runs from 7:30-10pm, with a lesson at 7pm. For more information check here. November 13th: Pueblo Contra Dance. Helle Hill will be calling. Washington Children’s Center located at the corner of S. Prairie and Thatcher. The dance runs from 7:30-10pm, with a lesson at 7pm. For more information check here. November 20th: Colorado School of Mines Contra Dance. Click HERE for a little video of the dance. October 2nd: Larkspur Family Barn Dance & Hog Roast has been cancelled. October 7th: Pueblo School for Arts & Sciences' Harvest Festival. 5-7pm. 2415 Jones Avenue. Open to the Public. More info HERE. October 9th: Pueblo Contra Dance. Richard Meyers will be calling. Washington Children’s Center located at the corner of S. Prairie and Thatcher. The dance runs from 7:30-10pm, with a lesson at 7pm. For more information check here. September 11th: Pueblo Contra Dance. Caller Duffy Boyle. Washington Children’s Center located at the corner of S. Prairie and Thatcher. The dance runs from 7:30-10pm, with a lesson at 7pm. For more information check here. September 18th: Pikes Peak Traditional Dance in Colorado Springs with Helle Hill Calling. Hillside Community Center, 925 S. Institute St. Beginner lesson at 7pm, dance runs 7:30 to 10pm. July 9: 8-11pm. Denver Community Dance. Pat Tognoni calling. Highlands Masonic Center, 3550 Federal Blvd., Denver. . Colorado Friends of Old Time Music and Dance. Here is a link to a map. June 4: First Friday Art Walk of Pueblo. 5-8pm (we will be playing from 6:30 - 7:30 pm) Union Ave & C St. More info HERE. June 5th: Contra Dance in Westcliffe CO. Held at the Old Gym, Custer Couny School at 709 Main St. Calls by Nick Wilson and Mel Folsom. Lesson starts at 7:30pm, dance runs from 8:00 - 10:00pm. June 19: Pueblo Contra Dance at the City Park Pavilion with Barb Kirchner from Berthoud Colorado calling. May 28: Denver Community Dance, Highlands Masonic Center, 3550 Federal Blvd., Denver. 8-11pm. Colorado Friends of Old Time Music and Dance. Here is a link to a map. April 10th: Pueblo Contra Dance at the City Park Pavilion with Pat Tognoni calling. The dance runs from 7-9:45pm, with a lesson at 6:30. For more information check here. March 13th: Pueblo Contra Dance at the City Park Pavilion with Chris Kermiet calling.. The dance runs from 7-9:45pm, with a lesson at 6:30. For more information check here. February 13th: Pueblo Contra Dance at the City Park Pavilion. Duffy Boyle will be calling with music by Nimble Fingers. The dance runs from 7-10pm, with a lesson at 6:30. For more information check here. February 20: Nimble Fingers playing the Colorado Springs contra dance Pikes Peak Traditional Dance with Richard Myers calling. January 9th: Grand opening of the Pueblo Contra Dance at the City Park Pavilion. Duffy Boyle from Denver will be calling to music by Nimble Fingers. The dance runs from 7-10pm, with a lesson at 6:30. For more information check here. Oct. 3: Durango Contra Dance: Park Elementary School, 623 East 5th Ave., Durango CO. Calls by Richard Wilson. Beginner instruction 7pm, Dance at 7:30pm. For more info, click here. Sept 10: "Loco for Local: An evening Farmer's Market" Sangre de Cristo Arts Center, Grande Staircase. Sept. 19: Colorado Springs contra dance Pikes Peak Traditional Dance with Duffy Boyle calling. August 13: "Loco for Local: An evening Farmer's Market" Sangre de Cristo Arts Center, Grande Staircase. August 28: Denver Community Dance, Highlands Masonic Center, 3550 Federal Blvd., Denver. 8-11pm. Colorado Friends of Old Time Music and Dance. Here is a link to a map. July 23: "Loco for Local: An evening Farmer's Market" Sangre de Cristo Arts Center, Grand Staircase.